Nutrition is like a pair of glasses. You have a pair of glasses that you like. After you have worn them for a few years, you get tired of them and want a change. Maybe there is a more up-to-date pair out there. Maybe my prescription changed and I need a new set of lenses. Nutrition is similar. You try a program or a diet for awhile and it seems okay, but you want to try something different. Maybe there is something new you want to learn and don’t know about? So you set up a session with a nutrition coach to find out if you need a new prescription for your nutrition program. You meet with the nutrition coach, they review your food logs, your symptoms, etc and devise a new program for you with a few changes to implement. Off you go, trying this new program out to see how it works. My clients typically see me every other week for their follow up sessions so they have enough time to work with the changes. Most of the time, clients have reported some amazing results – weight loss, sleeping better, no more mental fatigue and more energy during the day without hunger. My athletes will also report that they recover better and have more endurance or strength. Sometimes, even with adjustments, the client is not liking the suggestion fully as they are not able to make a smoothie in the morning, they are lacking the discipline of cooking meals and eat on the fly without planning, or maybe they eat out frequently and have a hard time changing the orders to meet the suggested guidelines of meal combinations. This means we need to modify the prescription to fit the client’s needs. The new plan is okay, but it isn’t great yet. In order for the plan to be great for that person, it has to fit in with their lifestyle and be accommodating to the ways they schedule their days with work, meetings, kids activities (if they have children), training and hobbies. Just like the pair of glasses I recently got, I love how they look on. Yes, I tried them on and thought they looked great! 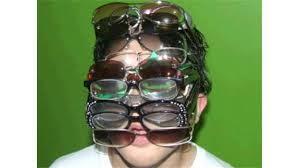 But after wearing them for a month (the optometrist did say I would get used to them….) I realized, there is something wrong with the prescription based on how I plan on using them. They are great for driving and seeing things over 800 yards away. But do I really need to see that far?? Maybe 500 yards is good enough? The trouble I have, is that I can only wear them to see far away. If you are standing 3 feet from me, which is usually how close one is when conversing, then you are blurry and I have to remove the glasses and put them on my head. The ground is distorted, too when I walk if i look down at all. I cannot wear them playing tennis as anything closer than the net (15-20 feet) is all blurry and distorted. My old pair I could wear for all of these uses. The new ones I cannot. So I will be going back to get the prescription altered so they do suit the uses for which I want to use the glasses. Based on this scenario, I think nutrition is like a pair of glasses. You need to find the right plan that fits you, your schedule and your life. If you need a new nutrition prescription or review, or want to explore the possibilities, schedule your 15 minute session to see what may be the best fit for you. I restore balance of body, mind and soul through nutrition, energy work and essential oils.